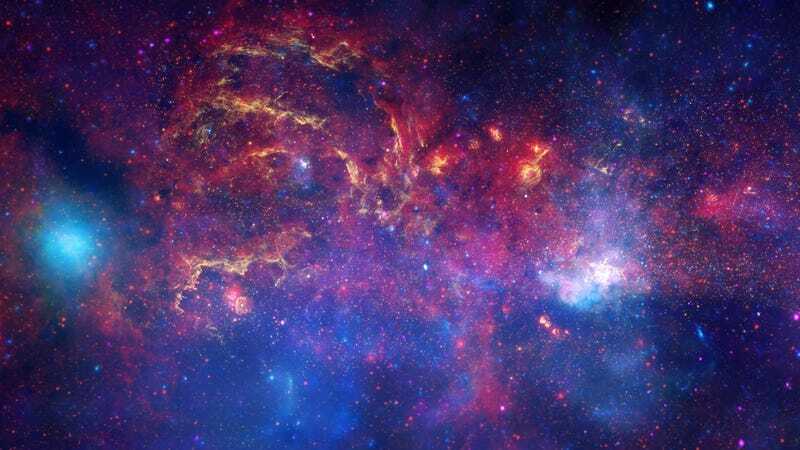 An international team of astronomers has discovered a huge expanse of space near the center of the Milky Way that’s devoid of young stars. This stellar desert extends for 8,000 light-years from the galactic core—and it hasn’t produced new stars for hundreds of millions of years. In a new paper published in the Monthly Notices of the Royal Astronomical Society, a team of astronomers led by Noriyuki Matsunaga from the University of Tokyo describe the eerily desolate place, known as a stellar void. Their analysis shows that a sizable portion of space within our galaxy’s Extreme Inner Disk features virtually no young stars, and that it’s likely been this way for a long time. There are billions of stars in our galaxy, some young and some old. By measuring the distribution of these stars, astronomers can better understand how the Milky Way formed and evolved. One type of star in particular, Cepheids, are among the youngest stars in the galaxy, ranging in age from 10 to 300 million years old (compared to our middle aged sun, which is 4.6 billion years old). Cepheids are easy to detect because they pulsate in a predictable pattern. What’s more, these cycles allow astronomers to estimate the distance and age of these stellar toddlers. Unfortunately, finding Cepheids in the inner Milky Way is difficult owing to all that interstellar dust blocking our view. To peer through this veil, and to see if any Cepheids exist in the Extreme Inner Disk, Matsunaga and his team made near-infrared observations of the region using a Japanese-South African telescope. They found hardly any Cepheids in the region, which came as a surprise. Previous work by the astronomers revealed some Cepheids at the central heart of the Milky Way in a region about 150 light-years in radius. But now they’ve found that outside this region there’s a huge “Cepheid desert” extending for a whopping 8,000 light-years from the center. To put that into perspective, the Milky Way itself measures 100,000 light-years across. That’s a whole lotta space with virtually nothing within it. Kinda spooky when you think about it. Interestingly, this discovery coincides well with the work of radio astronomers, who have likewise concluded that no new stars are being born in this region. Moving forward, the astronomers are going to study the movement and chemical composition of new Cepheids to better understand the formation and evolution of the Milky Way—and why it features such a barren core.